After really looking forward to this movie, I came out of the cinema slightly disappointed. Theres plenty of joke and action but the jokes seemed to be a bit meh, I only remembered laughing out loud twice and story line is a bit disjointed. The problem I had is in the DP 1 you had the shock factor of a tongue in cheek mavel character but in this movie that's already gone, so you have to rely on a good plot but unfortunately it lacked that, so I felt a little bit bored by it. I'm not saying it not a good movie but I expected a lot more but sadly I felt let down. David Leitch described the film's version of Domino as Zazie Beetz own "real fun interesting take". 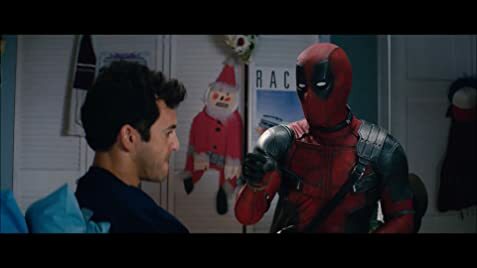 In the opening scene, when Deadpool is laying on the drums of fuel, he's wearing blue Crocs. But when Colossus comes to the apartment to retrieve him from the rubble, his feet and legs are shown in his black boots. End credits presented as Deadpool's "blueprints," with a Deadpool drawing matching its respective credit (I.e. with a camera for cinematography, or dressed as another character). At the Latin America dubbing, some names are changed to adapt the jokes to the local humor. One of the names Wade suggest for their son was Chayanne, Felicity was changed for the TV Show Chespirito, and Dave Matthews becomes Ricardo Arjona, an (un)popular singer.